We are a mixed Year 1 and 2 class and we love to learn! We are a special group of individuals who love many different things: reading, writing, maths, sports, art and many more. We are very lucky to have not one, but two teachers who believe that together we can reach our full potential and encourage us to always have high aspirations. Every day we aim to have a PART-E in our class by demonstrating our school values. (Pride, Achievement, Responsibility, Teamwork and Enjoyment) Our teachers have been very impressed with how well we have settled back into school and with our positive ‘can do’ attitude. It is lovely to see all the children arriving with big smiles and we are all looking forward to the year ahead! This term we are going back in time to learn about castles and the Great Fire of London. We will be updating our page regularly with our exciting learning so keep watching this space! Today we imagined that we were travelling to Paris in France. We researched facts about the Eiffel tower using the Internet. Did you know that the Eiffel Tower is 132 years old? On Monday 8th September kS1 went on an adventure to Berkeley Castle. We set off in the morning on a coach and soon arrived at the castle. First we heard about its defences and thought about how we would have got inside; some of us spotted a small secret door inside the main door! Then we split into four groups and had a guided tour around the castle. Our guide was so impressed with our attitude and our enthusiasm. We answered lots of questions and learnt lots of new facts. The kitchen had three massive fires and was used for preparing Medieval feasts like the ones we are going to have next week. After this we all felt hungry, so we had our picnic and played with our friends in the castle grounds. Then we had three different activities to complete. First, we dressed up in all sorts of outfits, from knights to princesses, from dragons to mermaids! Next, we explored some outdoor games in the grounds of the castle, learning circus skills that a jester might have used to entertain the King’s guest. Finally, we helped the dragon find her 8 babies, on a dragon trail around the castle. We loved the forest school and collect conkers in the autumn leaves. Chestnut class were just the best at lining up, listening and following instructions, making Miss Harris very proud. Thank you too to our parent helpers, without whom we wouldn’t have been able to enjoy a trip. What a lovely day! This term our Jigsaw focus has been “Being Me In My World”. We have been exploring the things we like in a learning space and the things we don’t. We have discussed responsibilities, rewards and sanctions. Each group created a freeze frame to represent each of our key learning behaviours and we had to guess which they were. Can you guess? I’m so proud of the maturity of Chestnut Class in creating this; they are all such engaged and enthusiastic learners who really want to do their Bowsland Best, always. This week, we applied our knowledge of nouns and adjectives, to describe our natural environment. We worked collaboratively to collect objects that fit nouns, adding adjectives to describe them. We then found things that fitted the adjective given. Finally we described our own finds using nouns and adjectives. What experts we are! This week, we applied our knowledge of number and place value to the outdoor environment. We found different ways to represent numbers from 1 to 10 and then use natural materials to show the place value of digits above ten. What creative learners in Chestnut Class! Miss Harris noticed that Chestnut Class needed to practice letter formation, using cursive joins. We used water, chalk and natural objects to create letter shapes and their joins outside, thinking particularly about the long letter family. On Monday 1st October PC Smart came to visit us. He talked to us about how he helps people and showed us his equipment, such as his baton, his handcuffs and his walkie-talkie. We all tried on his hat and learnt that it is tall, so that it can be seen above the crowds. Then he read us his new book called Officer George, about a police man and the things he does in the day to help people. We had lots of questions and some of us were inspired to become police officers. 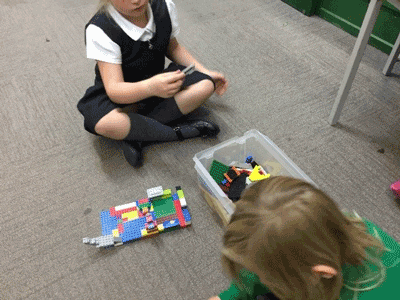 PS Smart told us that we would need the skills we learnt in school to help us. What a lovely afternoon visitor. Thank you PC Smart! This term we are stepping back in time to explore castle life during the medieval period. Today we had a special visitor in school. William the Conqueror himself came to tell us all about why he wanted to invade England and become King. He was a very greedy man! He asked if we could help him get across from Norway so we decided to make boats. We used lots of different junk materials and tested them to see if they would float. After, he gave us a royal decree ordering us to help him build castles and conquer England. 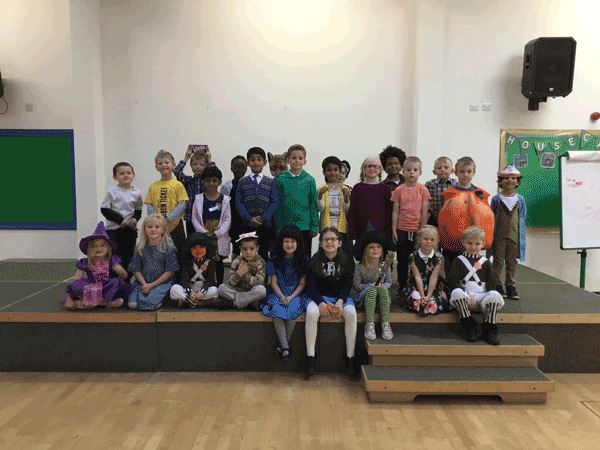 Today we celebrated Roald Dahl’s birthday by coming dressed up as our favourite characters. Throughout the day, we listened to stories written by Roald Dahl and imagined that we worked for Willy Wonka inventing our own sweets! 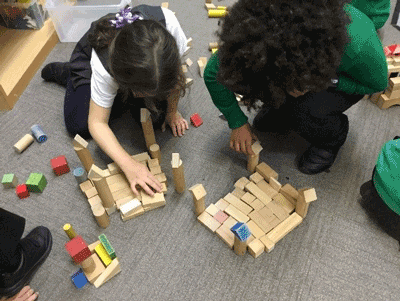 We have been applying our knowledge of castles in our continuous provision activities. This week, we have been learning about Kings and Queens. We watched Queen Elizabeth’s coronation and imagined that we guests in the cathedral. After, we imagined that we were meeting a King or Queen and learnt how to bow and curtsey. It was lots of fun! We learnt that a crown is symbolic headwear, which shows wealth, status and power. We designed and made our own crowns using lots of different art materials.